Would it surprise you to know: we received food stamps when getting started? I clearly need to tell my story sometime…from the beginning. 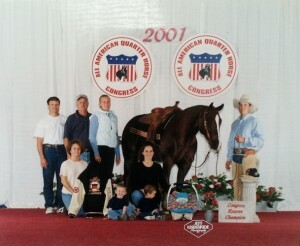 Jesse Westfall was Congress Reserve Champion the same day our youngest son was born. I grew up in a family that struggled to make ends meet daily. I attended two clinics and took less than 20 lessons before attending a college. The first 5 years of our marriage we made less than $20,000 per year (while working 14-16 hour days ‘real jobs’ and horses). We had 3 kids in the first four years of our marriage. We received food stamps early in our marriage. We trained & showed other peoples horses because we couldn’t afford to train & show our own. We started training horses by renting stalls at a boarding barn while both working full time jobs. Before becoming ‘famous’ my husband and I had a waiting list for horses to come into training…due to our reputation locally. When we stopped training horses we had a 2 year waiting list! There is still a demand that is not filled for horse trainers who have compassion, honesty and ability. I have a desire to help people get started in the equine industry. I have connections to find information and to share it with you. I need to hear your stories so I can know how to best help. If you are someone with an interest in getting started or improving your horse career then please, tell me your struggles. I’ve probably been there. If you know someone who would benefit from this please share so they can get involved. There is still room in this industry! It is possible…not easy…but possible! Hey Stacy- first off I would like to say I absolutely admire you and your accomplishments! I greatly appreciate this article and I would truley love to pick your brain. I started my equine business almost 4 years ago and it’s been a struggle. I know great things don’t come easy that’s for sure! I quit my full time job a year and a half ago to run my facility full-time. I just wanted to ask you a few questions on how to get more known, etc. Thank you and God bless! I grew up with horses but have never owned a horse. This dream of mine inspired me to enroll in university to one day (hopefully) be an equine vet so that I could afford a horse. As a full time college student with a part time job, it wouldn’t be fair to buy one now as I would rather focus on college. However, when do you finally know you are prepared to buy your first horse? This is a great question for a blog! My first quick tip is: the purchase price will most likely not be your greatest expense. Did you see todays blog with our foals face cut…yuck. If your lucky all goes well…but you need a plan for vet bills. At this point I have more in vet bills for horses than I do doctor bills for kids…I’m not complaining but I am tell it straight! Feed, board, vet, farrier, dentist…be prepared. Where there is a will; there is a way… Thank you for sharing your story…truely it takes action and doing to get there.. I will make time for it. Thanks Stacy, for sharing your story with us. Not knowing, I assumed you grew up in a “horsey-family” with everything at your fingertips: ranch, mentors, $ etc. To hear you rose from the bottom and struggled with the rest of us makes your success all the more admirable ! Thanks for being so honest and thanks again for sharing your horse knowledge! Hi Stacy! You are such an inspiration and give hope! I appreciate you sharing your journey. I’ve been a professional trainer for about 3 years now, started out part time. My question is how do you juggle family? We’re just starting our family. I’ve got an 18 month old boy and I’m due next month with our little girl. I’ve built up some clientele and absolutely love it. Eat, sleep, breath, horses! But at the same time I don’t want to take time away from my babies. (I mean they’re only little once.) Any input is greatly appreciated! Thank you! I’m 56, Stacy, and if I could do it all over I would. I would have persevered to have my own facility. People used to ask me to work with their horses when I was in my 30’s and then I got diverted by children, work 12+ hrs a day) and divorce. Training, teaching and riding have always been my love and if their was a way to go back in time, I would. If you are young and able bodied, don’t give up on your dream; trust me, as you will regret it in your later years. Thank you Stacy for all you do sharing with all of us. All my horses are gone now, but I still devour everything you put out! I knew from an early age what I wanted to do for a living and was heading down that road from 14 on. I worked for a popular trainer out of high school but then the economy tanked and he lost his barn. I had no job, no support from family and couldn’t afford to keep a horse. So I let horses go for about 5 years, getting back into it when I met my husband. We too have struggled to find time and finances to keep our dream alive and during the 22 years we’ve been together I became an RN thinking I’d have scheduling freedom and an income that could support the horses. I just ended up working 24/7 and finally ended up back in the horse business full time at 45. I’m now trying to establish myself as a trainer at an age when most people are taking it easy and planning their retirement. It’s good to see that honesty and hard work might be rewarded and that I do stand a chance. Stacy–I am a high school business teacher and I can appreciate how you are willing to offer advice to people who are potentially wanting to get into the equine business. If I could rewind my life to my earlier years I would have loved to be a part of the equine world. I do have a horse–Hildy–the one I took to your clinic and I am very happy with working with her everyday and building a stronger bond with her. I find joy when I can see the light bulb go on with my horse when I am trying to communicate with her. Buy the way she also teaches me some things as well. LOL One of my near future goals would be to buy a house and build an indoor arena where I could ride year round. I would love to have the children from my church come and learn to ride and cookout hamburgers and hot dogs. LOL I can teach the basics and I feel that would be fun! This is the motivation I needed! I’ve looked up to you since I first saw you ride Roxy and have always prided myself on being from the same area of ohio! (Holmes County!) I am most surprised and also comforted to know that your family struggled. My parents had it hard but always supported my crazy horse obsession. This post helps me remember my only dream is to ride and work with horses for a living no matter how rough the road may be! Thank you! Hope to see you out riding sometime! I’ve always admired your riding and your spirit and now I do even more. I’m a single mom who has experience many blows ober the last several years, the latest being the loss of my only job. I started out on a path, with a clear set goal of making my passion for horses into a career. I unfortunately have lost that path and have found myself working retail jobs desperately clinging to what I still want to make happen. I’m just so unsure of myself. I doubt my abilities due to unfair criticism and honestly for being out of the show scene for so long. Little money and little reputation isn’t proving to be beneficial in my plight to gain success. However, I have a renewed drive and am working hard to get a certification that will get me closer to being in a barn everyday, all day, and I have a little Buckskin that has the mind to take me where I want to go in the ring if I can make it happen. I’ve always said, let your horse be your validation. I still believe that and I’m still trying. Thank you for sharing and giving hope. You’re very welcome. I was with a long time friend over the weekend and we were sharing crazy memories (both past and present) and I realized how much more of the story there is to tell…because it helps everyone relate! I have been a passionate about horses my entire life! I am a Parelli Level 4 graduate on a quest to see how far I can take my horsemanship. I also have a strong desire to teach people how to communicate with horse so that they can have the relationship that they so desire! I have been trying to get started teaching for the last 8 months but my attempts have been unsuccessful. I have advertised locally, I have cards in all the local tack stores and I talk to people every chance I get. I am not sure how else to market myself? Keep going! It is possible! Yes, that is tiring! Any youngsters nearby that could learn by saddling? I was at a barn where one young lady saddled, walked & trotted horse to warm up, then handed it to the trainer and took the one he just dismounted from to cool out. Repeat, repeat, repeat. 4H kid? Question for you I have an 11,year old daughter that wants to show and I have the horse I just got her broke to ride for her, because like me my daughter loves horses as much as I do but there isn’t a 4-h that deals with horses in my county 🙁 , I was in 4-h from the age of 8 to 18 then showed one year in AQHA got champion 14-18 trail horse in 1990.. I would love nothing more to show again but my health won’t let me, but my daughter can as long as her horse catori acts right, never been shown, wasn’t professionally trained. . Do I take the horse to a show and just let her watch? I’ve done all I can do as a single mom..
Who started the horse? Is there a chance that she can hang out around that barn? And if there are horse shows nearby there are probably show barns that need stalls cleaned. I cleaned houses to get my horse hauled to shows when I was a kid. We had no trailer. There is this trainer bear Bolton but he wants 750 a month to train a horse.. the lady that broke my daughters horse catori wow I’m going to be nice but I gave her a stud colt out of my mare and a heeler pup to break her for two months, she only did it for a month and a half I gave her extra to trim catoris feet and when chey and I went there her feet looked like they did when we took her.. 🙁 bear bolton wouldn’t do anything like that for her and as for shows if I can find any I’ll try to take her and catori I just wish things were different and I wasn’t disabled any more.. I have the knowledge if my daughter just listens to me.. of course from 18 to 43 years old things change alot too.. I’ll see what I can do on my end but there’s not alot of paint horse people or quarter people down here in hick town Tennessee lol sorry henderson Tennessee all these people have walking horses..
My mother and I have had horse’s for over 20 years. The horses saved me from the teenage rebellious years. But at a weird time in my life, I felt I needed to leave the country life behind. I sold my horses, met a wonderful man, moved to the big city. That same wonderful man moved me back to the country, and we had two beautiful daughter’s after infertility battles. We too struggled daily. But he knew I would never be truly happy without a horse in my life. I have always wanted to own and manage my own riding stables. One where I can actually help people learn to trail ride and enjoy horses, not just hop on and go. I have worked for a couple of riding stables like that. It was neat for the customers, but not the horses. I have been in all different types of work from stall cleaner to office management. Now currently back to stall cleaning. And I love every minute of it. I still have a dream of owning my own horse business. I still want to help people enjoy trail riding. I also would like to be able to help horses enjoy people. Keep at it! Maybe start by writing down what you would like to change about the trail rides. You have a good point. Hi Stacy, yours is a wonderful success story. We had a desire to be cattle producers in Queensland, but I have a brother who inherited the land, so my husband and I set about getting our own. We started with 3 little boys and one more on the way! My horse and my husband had an accounting practice in partnership with another guy. So work we have and still do. But with a few lucky breaks and really hard work we have had some success. Raised 4 sons and have 2 mechanical engineers and two carpenters. We breed Angus cattle and Australian stock horses. Number 3 son is riding cutting horses in Canada right now for a fabulous trainer and playing polo crosse as well, number 4 son does campdrafting and works for us on the farm on weekends, the two older boys are home for branding and weaning. We still work way too many hours, but the message is, like yours, hard work pays off. We tell our sons to work hard and dream big. The horse industry in Australia is a tough gig too but if the two youngest want it, I’m sure it’s possible. You are fantastic to share your success and support. I am grateful every day for my own time in the saddle. Thanks for sharing your story. You experienced a spam filter…I approve comments to prevent crazy spam…but you made it! Stacy!!! I just wanted to update you! I took your advice! Why wait?! So I can’t buy a big barn and set up my own facility for therapeutic riding so I bit the bullet and reached out and starting September 16th I am working with a new student as she starts her her therapeutic riding lessons!! It was perfect timing! Thank you!!! Happy Dance! Go for it! You got a win, keep going! If you hit a block, keep going!